In the last few years, I have decided that I needed a specialized telescope, and that it was time to build it. The following links deal with designing, building and using a homebuilt 12" ultra light dob, DS-3 (Deep Space 3). Although this was my first amateur telescope making adventure, it ended up working out quite well. Finally, I want to give credit to my mentor and fellow ATM partner, Jim Lawrence. Without Jim's help, as well as the advice of other members of the local Albuquerque astronomy club (TAAS), this ultra light telescope would never have been attempted. 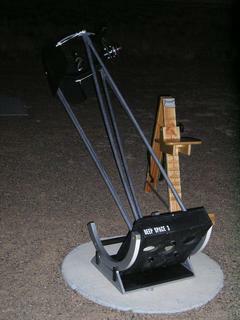 Links to Jim's telescope that served as a prototype for DS-3, along with his ongoing work on binocular telescopes can be found in the Astronomy Links section of this web site. Be sure to check out his 300mm Telescope (my prototype) and his 300mm Binocular (my dream scope, if it would fit into my car). 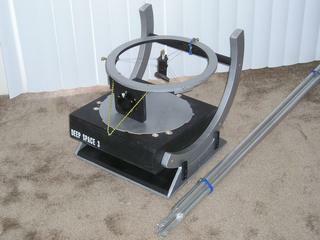 I have recently completed a 16" Deep Space Scope. DS-4 is located here. Light weight. 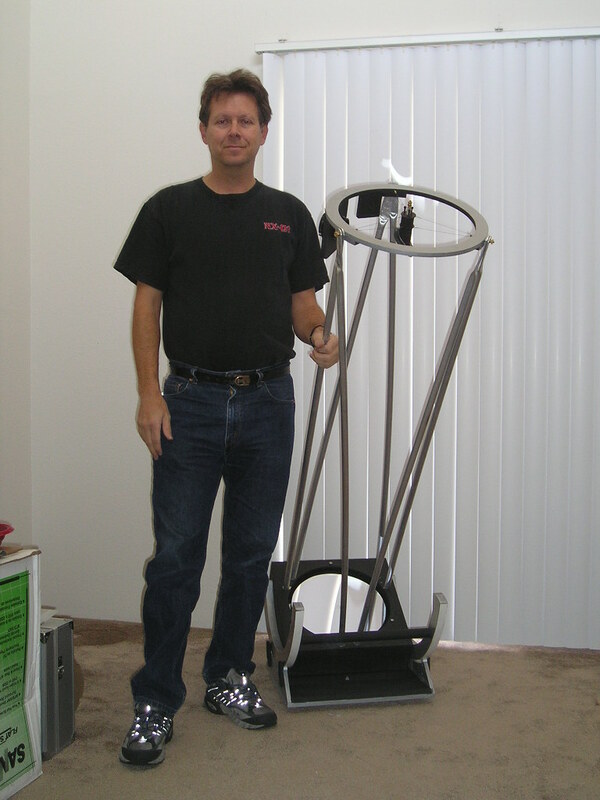 Weight of the heaviest single part of this lightweight dob should be less than 30 pounds, and the total should be less than 50 pounds. 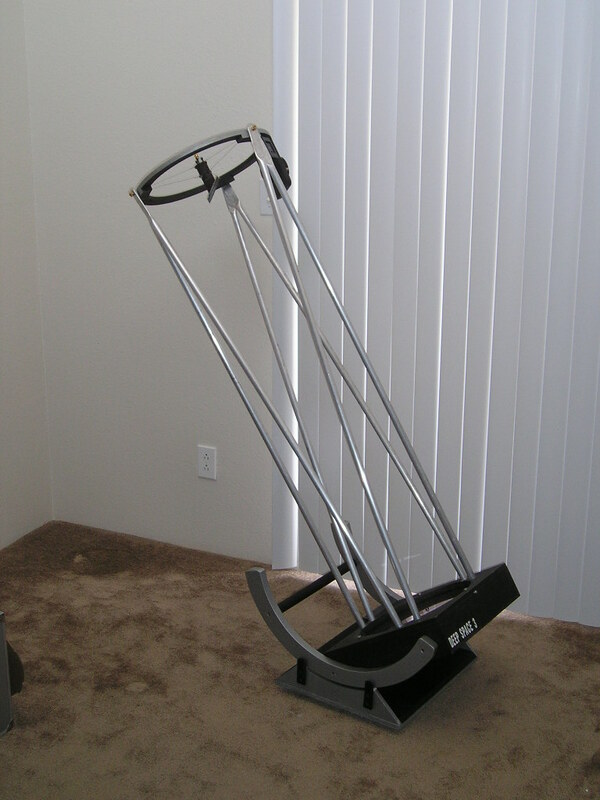 This is necessary since I live in a second floor apartment, and must carry the telescope upstairs each time I use it. Small size. 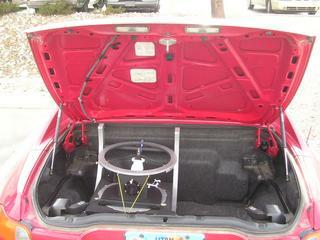 The telescope MUST fit in the trunk of my car, which is a Honda Del Sol. I also want space left over for carrying my eyepiece box and an observing chair. Why not buy a bigger vehicle? See my web page on Peak Oil. Large diameter mirror. Aperture rules for deep space! I want at least a 10" (10 inch) primary mirror, and preferably a 12" primary mirror. The primary mirror should be about f 5.0. From my experience, faster telescopes have mirror costs go up disproportionately fast for a given quality, and slower telescopes end up being too tall. Height at the eyepiece. I wanted the height of the eyepiece to be less than 60" when looking straight up, so that anyone could use the scope without needing a ladder or step. Setup time should be under 5 minutes. Setup of this truss dob should require no tools and include a minimum amount of setup or tear down. As a secondary design goal, this scope should be cool looking! Note - all pictures on this web site are clickable and will bring up full size pictures. Two pictures of the completed truss scope, without baffling. DS-3 ready to play. This lightweight dobsonian telescope torn down, and in the trunk of a Honda Del Sol. Focuser: KineOptics Helical Crayford HC-2, 2"
Packed size: width 17.5", length 21", height 19"
Size of this ultra light telescope if compressed for airline travel by removing the bearings (approximate, without poles): width: 15.5", length 17.5", height 9"
Results - DS-3 under the stars - This web page describes how each section of the telescope performed, along with my analysis of the whole. Generally, results have been spectacular. This homebuilt telescope was designed and built in the following order - the primary mirror selection, primary box and mirror cell, secondary ring and secondary cell, trusses, bearings, and last rocker box and ground board. Select the mirror. I knew from working with a friend that a 12" lightweight telescope design would just fit my specifications. So, a 12" f5.0 primary mirror was selected. This mirror size maximizes the amount of light received, while still meeting my size and weight requirements. This mirror is from Gary Hand at Hands On Optics, and is of very good quality - as per numerous "old salts" in the local club. Select the building materials. See below. Design the telescope using NEWT. I used NEWT(actually, it was NEWTWIN) to check clearances and secondary mirror size. See NEWT Design below for details. See Sources and Supplies below to get NEWT. Design the mirror cell using PLOP. OK, I didn't originally design the mirror cell using plop. I used Jim Lawrence's experience and a good dose of common sense. As per plop, I have about a 1/21 wave mirror cell. Not terribly bad, but not good. See Plop Design below for details. Design the mirror box and cell. The primary mirror cell will consist of three pads of plywood, attached to the mirror with double sided sticky tape. The mirror box will consist of plywood as follows: a single bottom layer with air holes, single layer sides and a double layer top plate (to add strength for the truss attachments). Mirror box is 15 1/2" X 15 1/2" X 4". Vertically through the center of the mirror box, this allows 1/2" for the bottom plate, 1/2" for the mirror cell plates, 1" for the springs between the mirror cell and the bottom plate, and 1 1/2" for the mirror. Total to the top of the mirror is 3 1/2". This gives 1/2" of air between the top of the mirror and the top of the mirror box. Horizontally, this gives 12" for the mirror, 1/2"*2 for airspace around the primary, and 3/4"*2 of wood to the edges. We need this much space for attachment points for the trusses. Design the secondary "cage". The secondary cage will consist of a single plywood ring, with "stuff" attached to it. Using Newt, an inside diameter of 13 1/2 inches was chosen for the upper ring. This allows "stuff" to intrude into the ring by 1/2", and still have 1/4" on each side of clear air. However, if the "stuff" is small this gives a full 3/4" of clear air, which reduces vinyetting to a minimum. "Stuff" is currently three brass threaded rods that attach the secondary ring to the spider, and the focuser. The focuser only intrudes into the secondary rings space when racked all the way in. We use a wire spider, which is made up of guitar string wire. The secondary cell will end up being a custom, lightweight setup. Note on the secondary cage. Any and all weight here will cause us trouble when trying to make small bearings and a small rocker box. So, we will try to keep the secondary "cage" weight VERY light. This also means that it is a VERY bad idea to add lots of gismos to the secondary cage. Trusses. Trusses for this truss telescope will be aluminum poles 3/4" in diameter, set into holes drilled into the mirror box. They are then flexed into place. The top end of these trusses will have a hole drilled in them, which will be placed over the exterior portion of the brass threaded rods from section 4 above. Truss lengths should be about 60" (focal length) + 1/2" (1" into the mirror box, mirror is 1/2" into the mirror box) + 3" (distance from center of the focuser to middle of the upper ring) - 8" (distance from the middle of the secondary to the middle of the focuser) + 1/2" (distance from hole at top of truss to top of truss) = 56". Mine ended up being about 54 1/2" long. Bearings. With the telescope assembled, and with a guess at the weight impact of the bearings, the center of gravity (CG) is found. This will be the center of the bearings. The bearings can be any size and work, as long as the center of the bearings is also the CG. However, the size of the bearings changes the friction of the altitude motion of the scope and size of the rocker box, so getting the correct size is important. Basically, bigger bearings seem to have a better "feel" in altitude motion. Also, for every inch increase in diameter of the bearings, we decrease an inch in the height of the rocker box sides and vice versa. I decided to attach the bearings directly to the sides of the mirror box, thus getting rid of any riser or additional structure to hold the bearings. This also makes the rocker box sides very small. You probably also want the bearings to not touch the ground when you set the scope on the ground without the rocker box. As a guess, this makes the outside bearing surface be about 11.5" in radius. For strength, we will make these bearings 1" wide and 2" thick. Rocker box and ground board. The rocker box bottom is made out of 1/2" plywood, backed up with additional plates of 1/2" plywood. The ground board is also made from 1/2" plywood. Everything is made out of plywood. 1/2" very good quality plywood was chosen. I am not sure if it is apple or birch ply, since a friend picked it up at the lumberyard. It really doesn't matter - what you want is good quality 1/2" ply without gaps or voids. A 4'X4' (4 foot by 4 foot) sheet should be plenty. 3/4" Aluminum was chosen as the materials for the truss poles. CA was used to glue everything together. CA comes from the hobby store. DUCK brand double sided sticky tape was used to hold the primary and secondary to their "cells". DUCK brand was chosen because it is reported to be stronger, and I was able to find the working strength specs on the net. When dividing the weight of the primary mirror by the surface area of the primary cell, I am well within safe working limits with DUCK brand double sided tape. NOTE: I have had a secondary fall off when using double sided tape. In the future, I will silicone glue the secondary to the mirror cell. All circular cuts were done with a router with a circle cutter attachment. This special tool is found at a special woodworking tool store. Lowe's, Home Depot and Sears did not have this tool. However, the prototype for this scope had all circles cut with a jig saw and cleaned up with a sander. Tools that were nice to have: Belt Sander (Used for about everything), and circle cutting router.